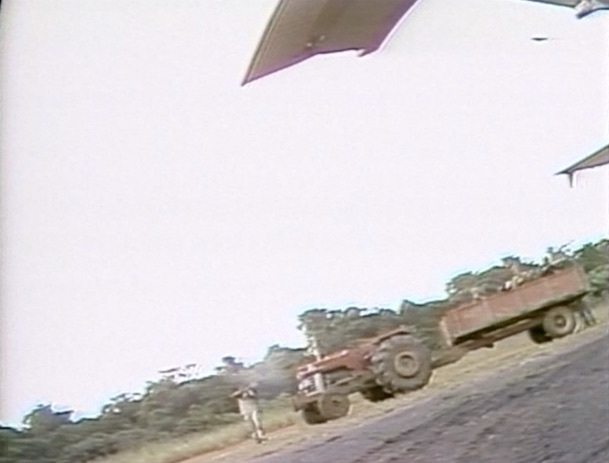 The NBC segment of newsreel footage of the final moments at the Port Kaituma airstrip is here. The tape, lasting three minutes and 30 seconds, begins with 20 seconds of color bars, then depicts approximately 2:40 of Ryan’s congressional party – including newsmen and members of Concerned Relatives – along with defecting Jonestown residents on the tarmac, preparing to board the aircraft. Footage of the shooting itself begins at 3:00 and lasts seven seconds. It is from a low and distorted angle because the NBC cameraman who filmed the shooting had fallen to the ground after being severely wounded. He was killed by a coup-de-grace shot a few moments later. The remaining 23 seconds are static and blank tape. This tape was released to this website pursuant to a Freedom of Information Act request. Last modified on February 28th, 2019.